In addition to car and van hire, we are also proud to add motorhomes to our fleet. Our 4 berth motorhomes are the perfect to way to explore Shetland and all the unique islands. 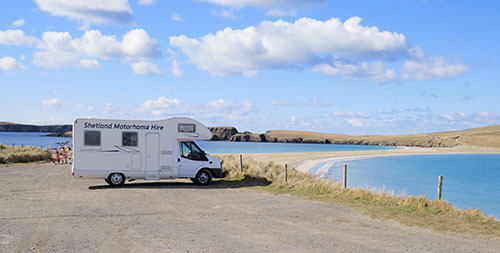 Shetland boasts an impressive number of caravan and motorhome hook up sites, as well as many stunning sites for wild camping, all spread throughout the islands allowing visitors to move around and enjoy every corner of our beautiful landscape and scenery. Our motorhomes give you the freedom to explore without having to return to a 'base' and are great for the carefree traveller who just wants to go where the mood takes you. We have ensured our motorhomes will provide comfortable accommodation during your stay and make sure to include everything you will need, plus a few extras! For full details and information visit our Shetland Motorhome Hire website.